Correction: While the iPad Air 2 and iPad mini 3 is listed on the Malaysia Apple online store with, these devices are not yet available for shipping but expect them to be available soon. Apologies for the confusion. 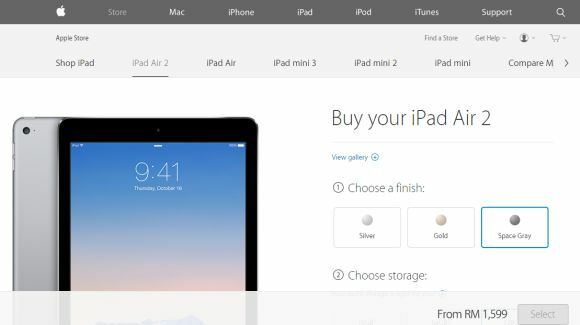 UPDATE: iPad Air 2 and iPad Mini 3 are now available for online orders. Estimated 2-4 days time to ship. If you’ve been holding out on getting a tablet, looks like Christmas came early for you because the iPad Air 2 and the iPad mini 3 are now available in Malaysia direct from the Apple online store. In terms of pricing, the iPad Air 2 starts from RM1,599 for the 16GB WiFi and RM2,029 for the 16GB LTE version. While the iPad mini 3 starts from RM1,279 for the 16GB WiFi and RM1,699 for the 16GB LTE. The iPad Air 2 sells for the same price as the iPad air that it replaces, which is a good thing. Also, the 32GB iPad Air variant has been discontinued, as a result, the 64GB and 128GB pricing is more affordable than it was in the previous gen. If you want a cheaper iPad, the pricing for the iPad mini and original iPad Air have been reduced recently. Full details here. Big thanks to Dominic Wong for the tip!.